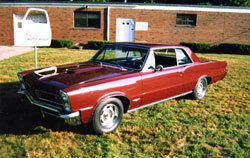 1965 Pontiac G.T.O. 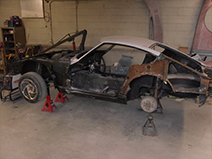 has been stripped to bare metal and determined to need new ¼ panels. 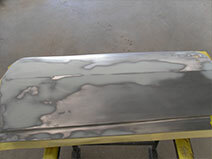 Replacement ¼ panels are trimmed and made ready to weld onto vehicle. 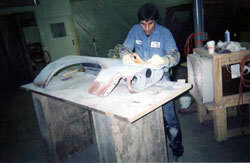 Right fender going through one of many block sanding operations. 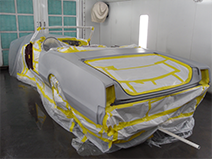 After all panels are repaired, vehicle has been primed and block sanded as necessary. 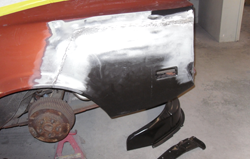 All hidden areas and door jambs will be painted. 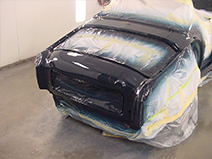 Vehicle in spray booth after receiving 4 base coats of color and 3 coats of urethane clear. 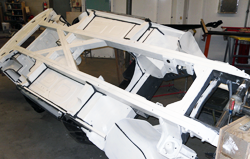 After color sanding and buffing, the vehicle is re-assembled and made ready for delivery. 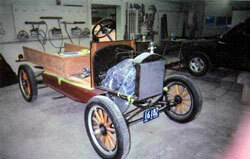 Rear view of vehicle during restoration. 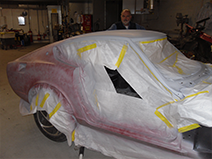 Restored panels have been trimmed out with final color and final assembly is underway. 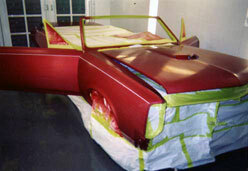 Here the vehicle is receiving a “Candy Apple” paint job. 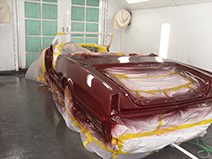 At this point the vehicle has received 3 base coats of metallic red, 3 coats of transparent red, and 2 coats of urethane clear. 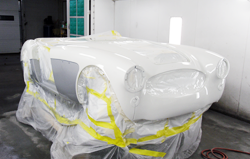 This customer wanted a white pinstripe “buried” under the final clear coat. 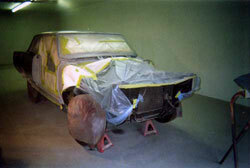 In this photo the white stripe has been applied. 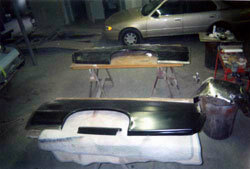 Two more coats of clear will be applied then block sanded and buffed. 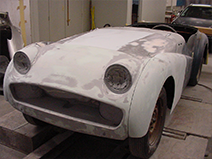 An old friend. 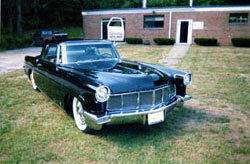 This beautiful 1956 Lincoln MVII visits us from time to time for spot work. 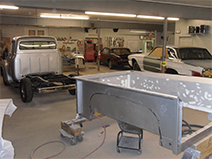 This 1926 Ford Model T pick-up is currently undergoing a total body rebuild. 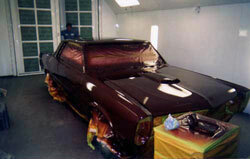 We will be refinishing all of the wood; as well as the body panels in deep maroon. 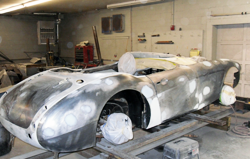 This 1962 Corvette was driven into a wall while undergoing mechanical repair at another shop. 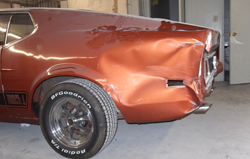 Insurance covered this repair. 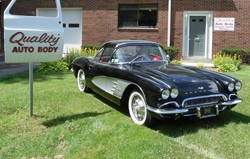 Finished repair on the Corvette, ready for delivery. 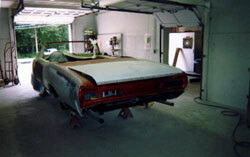 The restoration shop that was working on this '71 Duster went belly up about half way thru the job. 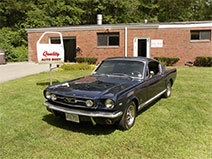 We managed to finish the job for the customer who now uses the vehicle for pleasure trips around New England. 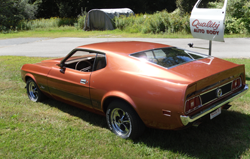 The left 1/4 panel was badly damaged on this '73 Mustang Mach 1. 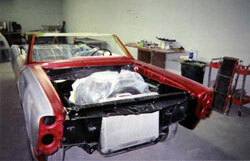 A new section of 1/4 panel had to be sectioned in because of the severity of the damage. 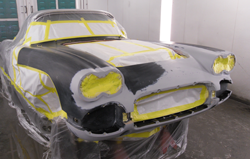 It took quite a bit of paint blending to achieve an invisible repair, but in the end it was worth it. 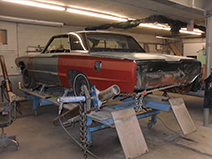 The arrival of a 1966 T-Bird for a full custom treatment. 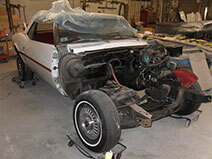 The rear section of the vehicle has been swayed to the left from a previous collision. 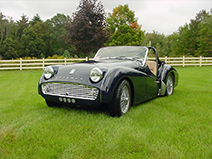 It must be corrected if we are to achieve acceptable body lines. 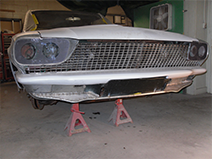 The front bumper and valance are being modified for a cleaner look. 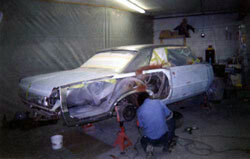 Here we have disassembled the body of this 1967 Olds Cutlass for a strip, body restoration and repaint. 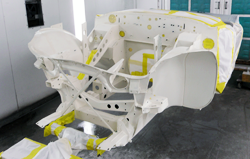 Bodywork to smooth out 50 years of road wars. 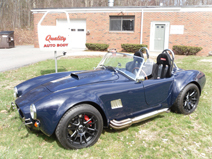 Finished product that the customer should enjoy for many years to come. 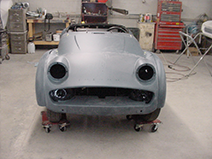 Pretty deep into this project at this point. 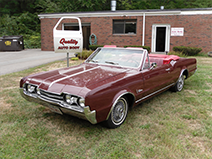 Now we are headed in the right direction. 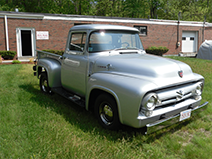 This 1956 F-150 came in to freshen up the bed and needed repair from a small front end collision. 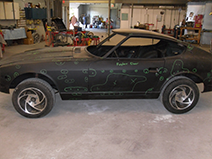 All prettied up and ready to go. 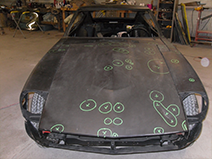 This 240-z has had a rough life. Here we are evaluating the condition of the body. 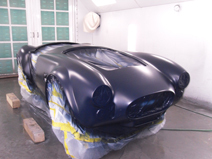 Looks like a lot of work ahead. 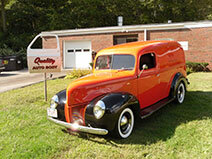 This 1940 Ford Sedan Delivery was a Hagerty referral in for some minor collision work. 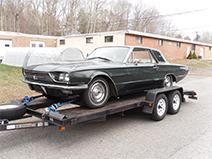 This 1966 Mustang 2+2 visited for a minor fender bender. 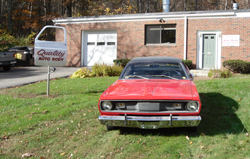 All is well now. 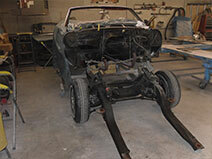 This 1967 Firebird Convertible is in for a full high driver quality restoration. 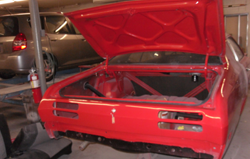 Bodywork on the Firebirds drivers door moving forward. 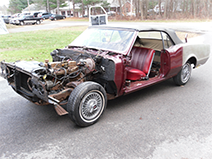 With the sub-frame removed, suspension work can begin.